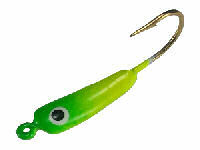 Maynards Tackle is continuing a tradition that was established in 1958. We are proud of the fact that each fishing lure is solely hand-crafted at Maynards Tackle from start to finish. Starting out with a plain hook, the lures are then cast, hand-painted, tied and packaged in-house. This enables Maynards to provide you with the best products and service in a timely manner. With thousands color combinations in various models to choose from, Maynards Tackle has become one of the largest manufacture in the United States for these kinds of jigs.